EASY BLUETOOTH PAIRING: Connect it to your smartphone, MP3 player, TV, computer or car stereo and enjoy your favorite tunes. WIRELESS INDUCTIVE POWER CHARGER: Charges while floating in the air. HANDS-FREE CALLS: With noise reduction technology, is a higher-quality alternative to your smartphoneâs speakerphone. LED LIGHTS: Visual effects add up to the amazing sound to create a unique ambiance. Liven up your social gatherings with the clear and vibrant 3D audio sound of the TechComm WA-01 levitating Bluetooth speaker. The WA-01 pairs with any device via Bluetooth, so you can connect it with your smartphone, MP3 player, or even use it as a TV speaker or computer speaker. Its 360-degree rotation is highlighted by LED lights on the speaker and on the base, making it especially striking at night. Noise reduction technology ensures the sound clarity of your music and hands-free calls. Hands-free Calling: noise reduction technology makes it a higher-quality alternative to your smartphoneâs speakerphone. LED Lights: visual effects add up to the amazing sound to create a unique ambiance.Lightweight and portable: enjoy its 3D audio sound at home, in your car, or take it with you anywhere you go. 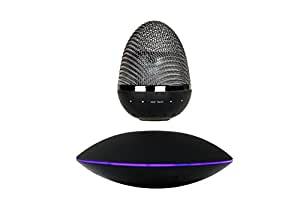 Comes with a special tool that helps you levitate the orb – you will find it helpful if you have no previous experience with levitating Bluetooth speakers. Package Includes: Bluetooth Speaker, Base, Charger, USB cable, AUX Cable, Levitation Assistance Tool, and User manual.